Ever encountered an “insufficient funds” error when withdrawing money from your Payoneer Mastercard through a local ATM? Don’t fret. You’re not the only one. It’s in fact a common scenario among freelancers who are attempting to withdraw funds from their Payoneer card for the first time. Don’t worry, there’s something you can do about it. To tell you right away, what you can do is to leave money and not withdraw the entire amount that the card contains. Leave at least Php 500 (around $12) on the card and you will be able to withdraw the remaining amount. The money you leave behind will be allotted for fees but there will still be something left after the fees. Local withdrawal fees are at Php 200 for international withdrawal. There’s also a $1 transaction fee every time you check the balance alone. So since you’re going to be charged anyway, make sure to make it count. Make a balance inquiry, continue with another transaction, and withdraw money right after. It happened to me when I needed to withdraw funds. The Payoneer “insufficient funds” error message keeps on popping out even if I left just enough for the transaction and withdrawal fees. It was a busy day that day and a lot of people are waiting behind the line so I just simply fled in dismay. I don’t want everyone to keep on waiting for me while my I suffer from futile efforts to withdraw. I didn’t want them to see the error either and I was embarrassed thinking they may have already seen it. I didn’t call Payoneer. I tried to Google about the problem first and found a suggestion worth trying. (See opening section for instructions). So I tried it again the next time I had a chance to do so and it did work! I’m not really using Payoneer for freelancer payments. I can actually withdraw directly from a freelancing site towards a local bank. I also have an EON Cyber VISA debit card to act as a credit card for online purchases. 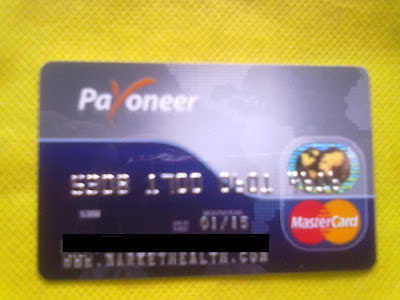 I just needed Payoneer to have it linked with Market Health. More about Market Health through this entry – Revitol, Health Buy, and Markethealth. Commissions from Market Health are deposited via Payoneer. More about the affiliate commission for future posts. There should have been no reason for me to withdraw had it been not for a glitch caused by the Facebook ad. See post - Facebook Ad for Your Site, Blog, or Page. There was a Facebook debit showing on the Payoneer transaction history. Although it was only a single time and I didn’t bother contacting Facebook for it, I didn’t want to wait until they charge more. So I simply thought of withdrawing the funds from the card, thus, the Payoneer “insufficient funds” error. But that’s already taken care of. So once again, for the Payoneer “insufficient funds” error, all that’s needed to be done is to leave at least Php 500 on the card. There is no concrete explanation behind this and I wouldn’t bother calling Payoneer just to ask; for as long as it works, you can try it too. its sad because it will cost you Php200.00, tried it with BDO and they did charge me even if "insufficient fund" is considered as rejected transaction. I will never use Payoneer again. Sorry to hear about what happened to you. There is a workaround as mentioned in the first section of this post. Did you also try to contact Payoneer's support? I will try this strategy of leaving atleast 12$ (500php) to my payoneer before withdrawing . It works for me...I am from Cebu, I withdraw in BDO bank..:).. Thank you. it was exactly the same with me. I had exactly 12 dollars and i was using it for the first time. I tried to withdraw all to see if it indeed works. I got insufficient funds. I felt i should check google and i found your site and article. Now i checked my account and they have deducted about 3. something dollars already. I will learn more by contacting the payoneer support. Do you know i had the same expereince at the ATM as you had in Nigeria. I had to leave becuase there were many people behind me... laugh. Aw, that's sad to hear. It's the downside to using the Payoneer card. I no longer use it.